A fast and easy way to trace designs and patterns for: creative keepsaking, embossing, quilting, stencilling, sewing projects and many more art and craft uses. This 10" x 12" Lightracer Light Box Features a conveniently slanted tracing surface and a long life flourescent lamp (included). 5 year warranty. The Artograph Lightracer is a fast and easy way to trace designs and patterns for: creative keepsaking, embossing, quilting, stencilling, sewing projects and many more art and craft uses. 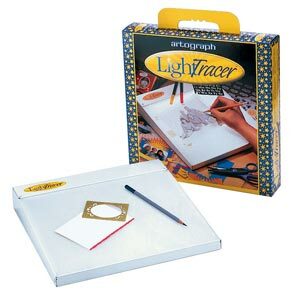 This 10" x 12" Lightracer Light Box features a conveniently slanted tracing surface and a long life flourescent lamp (included). 5 year warranty.